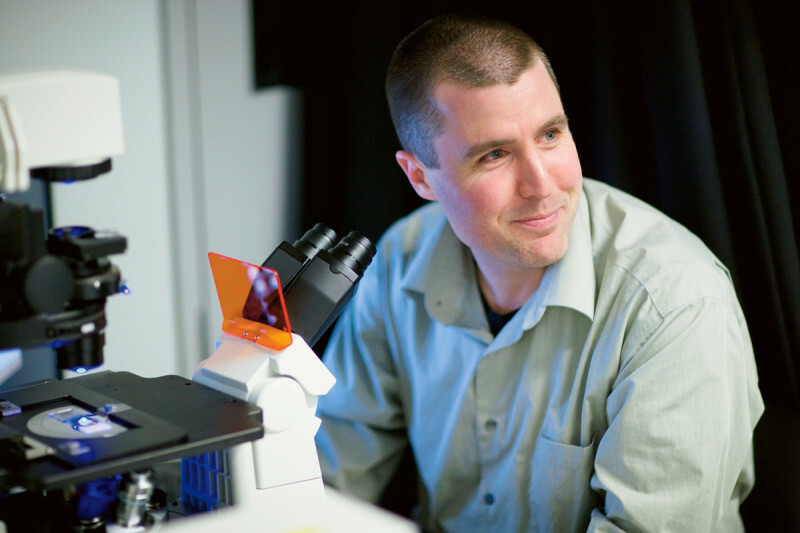 Cell biologist Michael Overholtzer studies the mechanisms of tumor initiation and progression, cell adhesion, and cell death. In exploring genes that make normal cells turn cancerous, he has encountered a phenomenon that one day could prove useful for treating cancer.We spoke with Dr. Overholtzer in 2009, soon after he joined the Sloan Kettering Institute’s Cell Biology Program. I think the way I was raised has a lot to do with my current profession. Growing up in a small town in eastern Pennsylvania, my sister and I were encouraged by our parents to be creative and imaginative, and to ask questions about everything. Sure enough, we both became scientists. Since I had an early passion for music, I chose to attend Ithaca College, a liberal arts school that has an exceptional music program. But I ended up growing addicted to science, spending each summer and my whole senior year in the laboratory of Vicki Cameron, who is a wonderful biology teacher. She was the first of three strong role models who have shaped me into the scientist I am today. Somehow, I managed to complete a music minor in voice as well. As it turns out, I’m a much better scientist than musician, but music remains a big part of my life. In 1996, I entered a graduate program at Princeton University and the laboratory of Arnold Levine [now a professor at the Institute for Advanced Study]. Arnie is a big thinker and leader in cancer biology, and also a wonderful person. In his laboratory, I examined the role of p53, a gene that is essential in protecting our cells from cancer. Halfway through my training, we moved the lab to The Rockefeller University. Until then I had only lived in smaller communities, so moving to New York was quite an experience. After two weeks, I was in love with the city. To better understand how p53 functions, and to find other genes that can either cause or prevent cancer, we started looking at human tumors in collaboration with investigators here at Memorial Sloan Kettering, which is right across the street from Rockefeller. This experience had an important impact on my career. In an environment where you have cancer patients around you, the real reasons we perform research become extremely clear: Science is not just about satisfying one’s own curiosities, but ultimately about trying to help people. In 2002, when I started my postgraduate work with Joan Brugge at Harvard Medical School, I continued searching for genes that are important in cancer. We used a model system of human breast epithelial cells grown in three-dimensional structures — mimicking how these cells are arranged in real breast tissue — to test how the cells’ behavior would change after different genes had been activated or inhibited. One day, we stumbled upon a discovery that would become the main focus of my research. Under the microscope, we noticed what appeared to be one cell completely encapsulated inside another. It takes someone like Joan — who has a great imagination and motivation to break new ground — to follow up on a peculiar observation like that. Many times, what one sees in a culture dish will turn out to be irrelevant for how cells behave in a living organism. But one of our collaborators, a pathologist, remarked that cell-in-cell structures had been seen before, in patients’ tumors. It was exciting to learn that what we had discovered in the lab, a phenomenon we call entosis, actually happens in human cancer. At Memorial Sloan Kettering, Science is fun and collaborations are happening all the time. This is why I love being here. To follow up on these findings, I wanted to be at a cancer center where I could match my research with what oncologists see in the clinic. I couldn’t imagine a more perfect place than Memorial Sloan Kettering. When an Assistant Member position in the program became available, I realized it was my dream job. As soon as I was offered an opportunity to join, I canceled all my interviews at other places because this is where I wanted to be. Now, as I’m starting up my lab, my main goal is to understand what role entosis has in a patient’s cancer. A cell trapped by entosis is initially alive — it can divide inside the cell that has engulfed it, and sometimes it will be released. But most internalized cells are eventually killed. This tells us we’ve discovered a new way in which cancer cells can be killed. Normal cells can kill themselves by a cell-death mechanism known as apoptosis, which is triggered, for instance, when a cell’s DNA has been damaged beyond repair. Cancer cells often learn to avoid apoptosis, allowing them to live and grow indefinitely and to propagate mutations (genetic changes). This is one of the reasons why it has been difficult to design drugs that kill tumors effectively. As a death mechanism, entosis is most interesting because it can eliminate cells that have learned to avoid apoptosis. The discovery of these kinds of “alternative” death mechanisms gives us hope that one day, therapies designed to induce cell death will be more effective in shrinking a patient’s tumor, or in stopping its growth. For now, our first priority is to examine in vitro the details of how a cell becomes internalized and dies. We will then employ mouse models of human breast cancer to ask if entosis can influence a tumor’s growth or progression. My team is also studying a protein called YAP. During my time at Harvard, we found that YAP can promote tumor growth. In some tumors, YAP activates a number of genes that are normally silent in adult tissues, making cells grow faster and survive longer. Recently, my coworkers and I found that YAP also plays a direct role in cell division, helping newly replicated cells to separate into two. Failures in this process can lead to aneuploidy, an abnormal number of chromosomes per cell, which is a hallmark of cancer. The way this project is developing, it’s leading us into another exciting field of cell biology. At Memorial Sloan Kettering, science is fun and collaborations are happening all the time. This is why I love being here. People are very open in discussing their preliminary findings and this is filtered down at every level — from faculty talks to work-in-progress meetings with junior scientists. My lab has research interests in common with many other groups at Memorial, and we are already chasing down ideas of how to work together. It may sound trivial, but you don’t get that everywhere you go. I feel a responsibility for the patients in Memorial Hospital. Since we have discovered something that takes place in real tumors, this gives us hope that what we’re learning could affect cancer patients’ lives somewhere down the line. I want the research in my lab to be driven by great curiosity and imagination, to uncover new or unusual ideas, but always with the goal of sifting through these ideas to improve our understanding of human disease.